Heading out for the Disney marathon trip today (more on that soon – if I survive!) 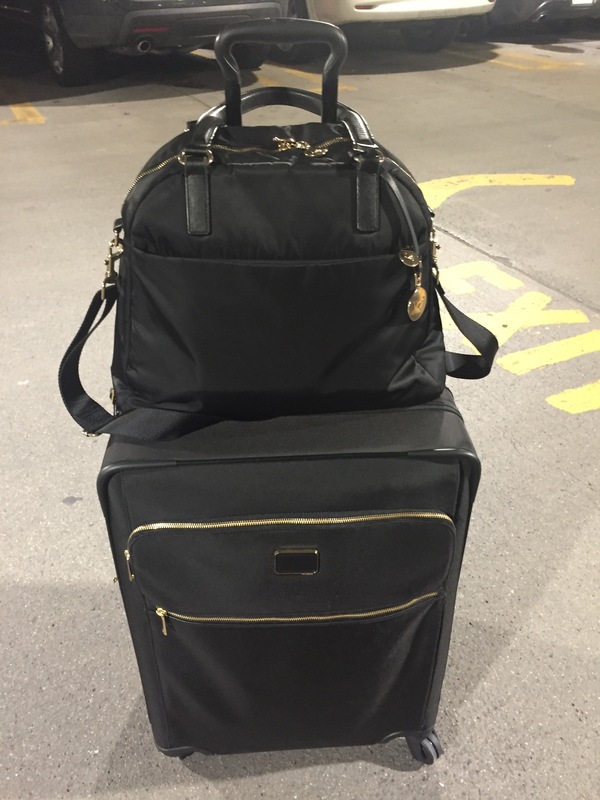 and amidst my combination of fear and excitement is the joy of debuting two new travel bags. I travel a lot and have been wanting more reliable and still stylish options for both a medium hall trip (think 3-5 days of work clothes, workout gear, and evening casual or black tie options) and a long weekend getaway (inclusive of noodling around clothes, at least one running get up, and an out on the town outfit). I will confess the latter are for date weekends/race weekends which I don’t do enough of but hey…Anyway, the point is these bags are in general for separate purposes. This particular trip, however, combines a race weekend, a family Disney mini trip, and a 4 day conference with multiple evening outfit changes. So, my pre-race energy was amped by the joy of putting BOTH new bags to use. Here are some views from the manufacturer. To be sure, it is a heavy suitcase compared to many others on the market of this size. Without my stuff it checks in at 17lbs. But the design is gorgeous and construction is durable. The interior is split into a suited side (I fit 3 work appropriate dresses, spanx, and 2 pairs of heels on that side) and a larger compartment with two side zip compartments and a 3 pouch (one basic, on velvet lines, and one waterproof) carrier with a hook that doubles as the compression strap. The wheels are really smooth and allow for unencumbered 4 way motion. It also expands via solid brackets in the middle of the bag so no tipping over when expanded (but there is no way I would be able to do that and stay under 50lbs). 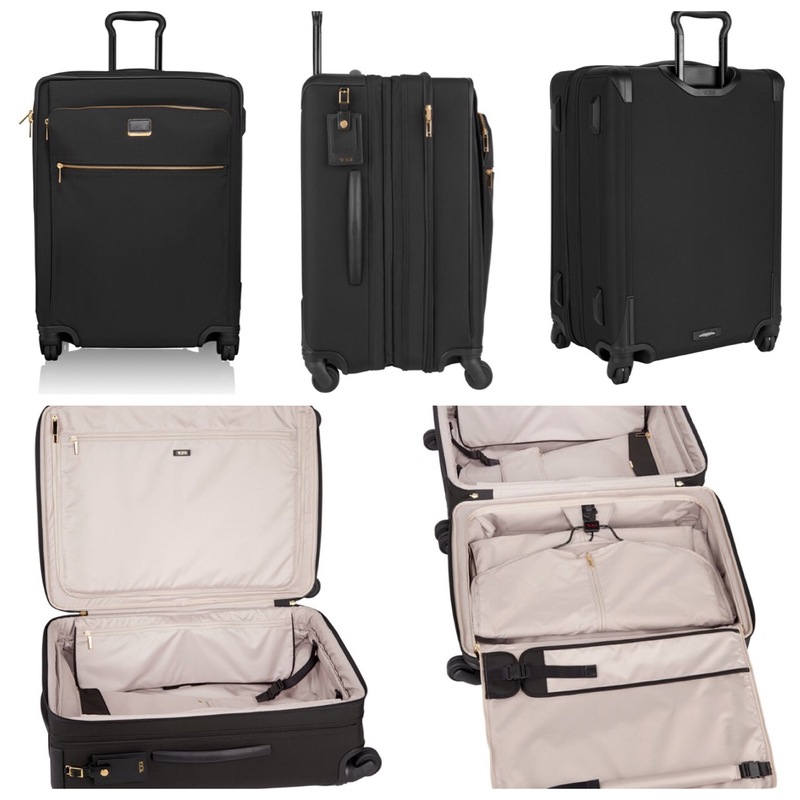 Of course, it’s all backed by Tumi’s warranty and much lauded customer service. This is an investment piece. I especially love the gold tone hardware that is stylish but not gaudy. I am looking forward to many trips for years to come with this medium haul suitcase. 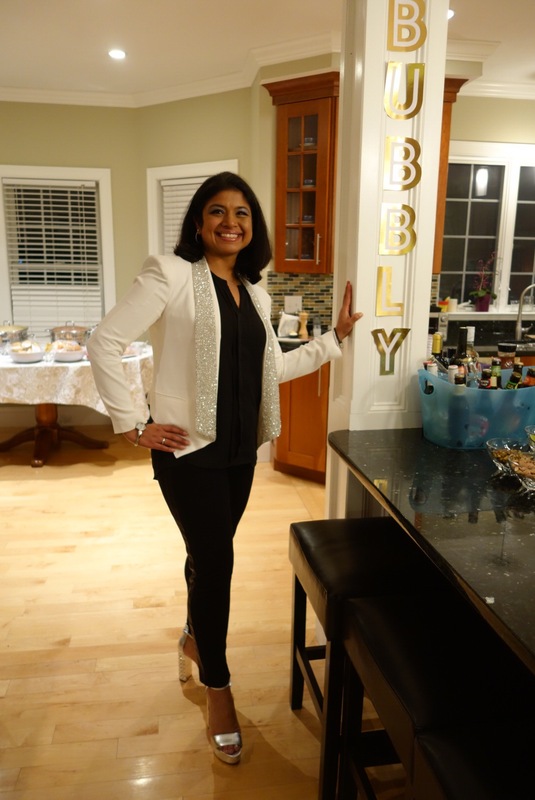 We decided to throw a last minute holiday event recently mostly owing to the fact that I had a blazer and shoes that NEEDED to be worn. This a a ball drop outfit to be sure, especially the heels. Happy New Year! Why I changed my mind about Colin Kaepernick, and you should, too. I, as an individual, am as pretty WASP-y as you can get. I am white, middle class, Protestant, grew up mostly in the South, and come from a military family – my grandfather was in the Army, my brother was in the Marines, and I have 3 uncles who served in the Navy. So, when I first heard about and subsequently saw Colin Kaepernick’s response to the National Anthem, it stung. Okay, I’m hedging. It more than stung. I thought it was disrespectful and I flat out disagreed with it. Yeah, yeah, my family members served to preserve his right of free speech, I get it. Now, I am not in any way going to condone his other choices, but I am going to specifically address his choice to kneel during the National Anthem. I thought what he was doing was wrong. I now realize I am the one that was wrong, and here is why. I have written previously regarding my feelings about the current state of our country, working alongside members of law enforcement every day, being married to a black man, and being the mother of two biracial boys. The current level of violence in this country, American citizen on American citizen, is nauseating. And we are scared – black, white, police, non-police. For each other, our neighbors, our friends, our husbands, our wives, our sons, our daughters. And we are letting that FEAR WIN. I have realized… even in 2016, we are still very much of country of “us” vs “them”. I have listened to so many people talk about how Colin Kaepernick is being disrespectful by kneeling. Military, non-military, men, women…. but all mostly white. And that got me thinking. I started thinking about race relations in this country, and I started thinking about my own family, and my fears for my children. If I had something to say, once my children started driving and I began to pray for them to come home safely every night… not just in fear of a car accident, but in fear of them getting shot… How could I draw attention to it? How could I get my voice heard? How could I start a national conversation to actually help the situation, and make some progress? So I had to ask myself, how do “we” (White America) want “them” (Black America) to protest? To show their fear? To demonstrate their pain? We complained in the 1960s with sit-ins and boycotts (“they are interrupting businesses”), we judge harshly with riots (“they are being violent”), and the church prayer meetings largely get ignored. So how, in this day and age, are we going to allow a population of people in the United States, the “land of the free” be heard? How are “we” going to allow “them” to start a conversation with “us”? My guess is, Colin Kaepernick is scared for this country. I know I am. As a trauma surgeon, I am the one behind the scenes, with my hands covered in the blood of the injured. Their blood not only stains my skin, it stains my soul. The patients I have lost live forever in my mind. Enough blood has already been spilled onto our streets. With all the violence that is happening, why can’t we prioritize our feelings and support a non-violent means of expression? He is nonviolently expressing his fear, his anger over what is happening by kneeling. He’s not turning his back. He’s not burning anything. He isn’t breaking into a building, or throwing rocks at police. He is kneeling, which is still a position of respect. A man kneels to ask a woman to become his wife. People kneel to pray. And he is bringing attention to an issue that should be in all of our minds and on all of our hearts. As Americans, regardless of race, we should be encouraging non-violent means of communication, and kneeling during our National Anthem, is one of them. I’m not saying everyone should sign up for the Colin Kaepernick fan club, but what I am saying is that we should stop focusing on the how of the protest and start focusing on the why of the protest. The only way for there to not be an “us” and “them” is to allow each other to not only speak, but also to be heard. So, White America, I encourage all of us to put on the hearing aids, and start listening. Otis was our first baby. 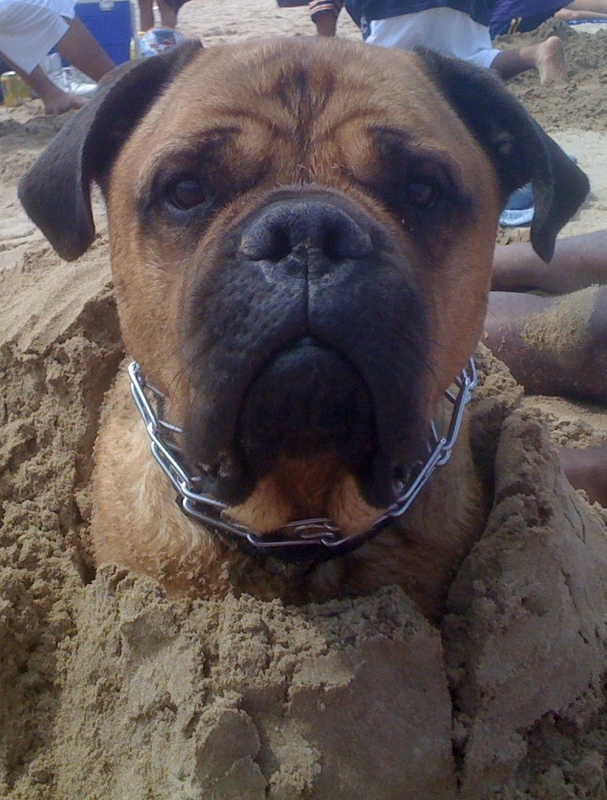 He was covered in a caramel colored fur, weighed 150 pounds and was the best Bullmastiff dog anyone could ask for. He protected me from my husband’s incessant tickle attacks and thought that my lap was the best place for him to try and sit. Two years ago, I was walking Otis and he suddenly collapsed. After an extensive workup including an EKG, blood work and an ultrasound of his heart by the doggie Cardiologist (yes, they do exist), we started him on a new regimen of medications for his heart failure. It cost $300 a month but was worth every penny – almost overnight he was a new dog, back to his usual daily routine and enjoying all the activities he loved most in the world. About a year later though, he started declining again. His favorite spot to sleep was on the floor, right next to my side of the bed. But our bedroom was upstairs, and he just couldn’t make it anymore. He had to sleep by himself. He couldn’t go on walks. He slowly but surely began to get left out of family activities, and for a dog who was as much a part of our family as a pet could be, this was life-altering. He couldn’t participate in any activity which had previously given him joy. He was becoming more and more isolated, becoming physically separated from the people he loved most in the world. That’s when I knew – it was time to say goodbye. It still hurts, but I know it was the most unselfish and loving thing I could do – focus on him, his wants and his needs, instead of me and my own. As a trauma and critical care surgeon, all too often I see families struggle in the intensive care unit with loved ones who have devastating diagnoses and injuries. Now if only most of us treated our parents and loved ones as we do our pets – knowing and respecting their wishes, valuing the quality of their life over the quantity. Granted, I never had to ask Otis what he enjoyed in life, what his priorities were or what kind of life he wanted to lead – it was pretty self-evident. Your loved ones are clearly more complicated than that, and that’s even more reason their wishes should be known. Do they want to be kept alive by machines with no hope of a recovery that would allow them to participate in their favorite activities? Or be able to participate in relationships with their family? Do they want you to try everything no matter what the outcome might be? If they cease to enjoy eating and can’t communicate anymore, do they want you to put a feeding tube in them? These are the types of questions and conversations that I implore you to ask and have with your family members – no matter their age, no matter how healthy they are at this very moment, because things can change for any of us… in an instant. In situations like these, my role as the intensive care physician caring for your family member is to find out what HE or SHE would want if they could speak for him or herself, not what anyone else wants. But I’ll never know your loved one like you do. I don’t know what they value in life, what they hold most dear. That’s why I need YOU to help me help them live or even die in the manner they’d want. Because let me tell you, there are a lot of things I can “do”. But your job is to help me make sure I’m doing these things for your loved one, not to them. I’m not asking you to make a decision, I’m asking you to tell me more about them. You aren’t “turning off” any machines, you’re telling me what kind of life your loved one wants… or doesn’t want, and it’s my job to help make that happen to the best of my ability. Many of you may already know the answers to these tough questions, but I know just as many of you may not. Nope, it’s not going to be a fun conversation. You’re not going to enjoy it. But don’t let your fear of the conversation prevent you from being able to speak for your loved one because they physically can’t. Don’t let your discomfort then put you in a situation whereby you’re not honoring your loved one’s wishes, simply because you don’t know how they’d want their life to end. The greatest sign of love is selflessness – be selfless enough to have the conversation. Be selfless enough to honor their wishes. And know, when the time comes, you’re showing your love in the most profound way possible. 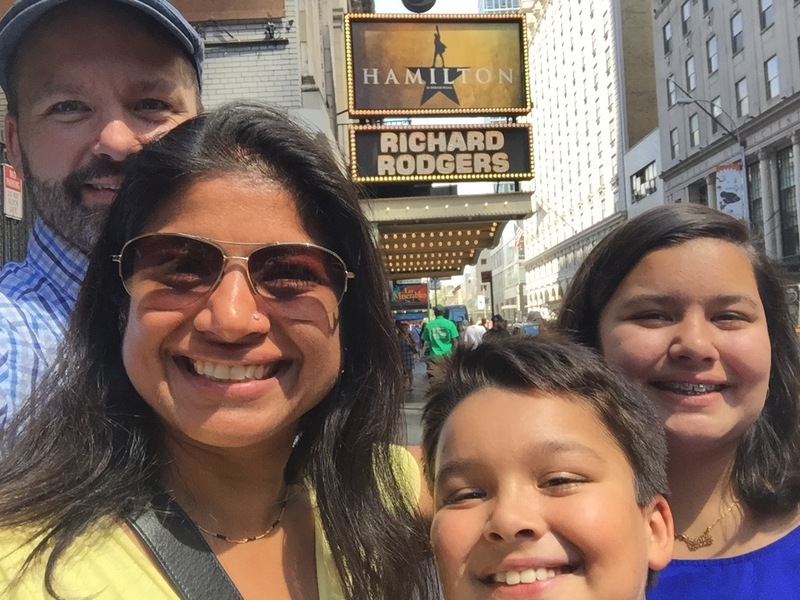 Like much of America, my family is currently obsessed with everything Hamilton on Broadway. We jammed to the sound track all summer. The season culminated with a late August trip to the show which I described on social media as the best day of my life. Seeing the show, the actors, the set, and choreography, come to life with lyrics we had all memorized was such an amazing experience. Part of that was pinching myself that it was actually happening (NB: Tickets now that the original cast is gone are not that hard to find on resale sites but still cost quite a bit above face value.) And the other parts were one particular segment that just cut into my soul when I saw the character of Aaron Burr singing it. Let me provide you context. Burr is an orphan who is in love with a married woman. He has decided that with everything he has gone through, all of the losses he has suffered, he is willing “to wait” for the woman he loves. As someone who was taught to hate Burr by her high school history teacher who was a Hamilton scholar, this humanization of Aaron Burr was a bit off-putting at first. But the reason I simply could not stop the tears while experiencing the song with all of my senses as the show was not about the forbidden love story behind it, rather is was the commentary on death. and we keep living anyway. These words resonate so strongly with my trauma surgeon’s soul. We provide care indiscriminately, irrespective of race, socio-economic status, mechanism of injury, insurance, etc. And we lose people. Sometimes they arrive lifeless; sometimes our efforts fail. When that happens we are broken. We wonder if we could have done anything differently; did we make a mistake? But we have to go on “living” because there are more patients waiting. Some of them are sinners while others are saints and it doesn’t matter we treat them all the same. Then we wait for the next patient to arrive. The title of the song is Wait for It. The Hamilton sound track is still more or less played in a continuous loop in my home, in our cars, on my runs. And every time I hear this song I cry. I can’t help it. It simultaneously breaks my heart for all my patients who have died and provides me reason to keep coming back to this very emotionally challenging and physically exhausting profession. I know it was not Lin Manuel Miranda intent to write this segment of music (the lyrics and the accompaniment which is haunting) for the trauma surgeon in me but that has been it’s effect and I am so grateful. 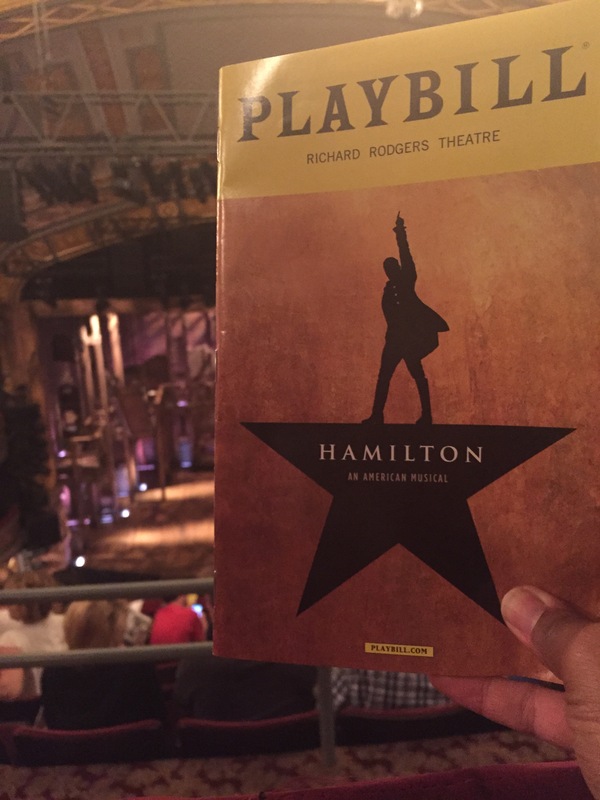 And as for the burnout that is particularly rampant in my specialty, despite the tears from this particular song, the overall experience of seeing the show on Broadway was truly one of the happiest days of my life – a perfect way to spend a weekend off and return to work refreshed and ready to wait for it. 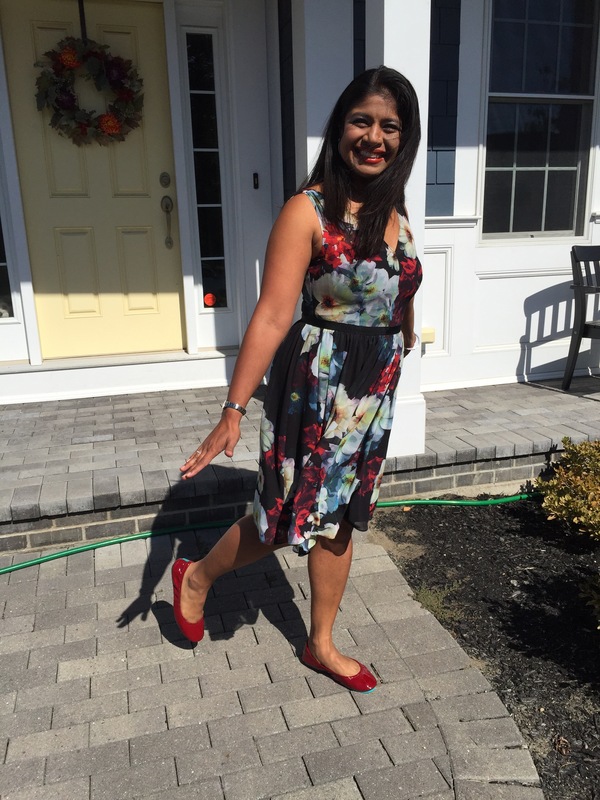 Ordinarily, I relish dressy occasions to ditch the scrubs and clogs in favor of a cute dress and a pair of my coveted heels. While I have a number of very comfortable heels, at the end of the day they are still heels forcing me to maintain a high half toe for a long time, often with my toes pushed together. So I have opted to spend the rest of the fall as much as possible in flats as a torture my toes regularly to train for a marathon (more on that someday if I survive!). 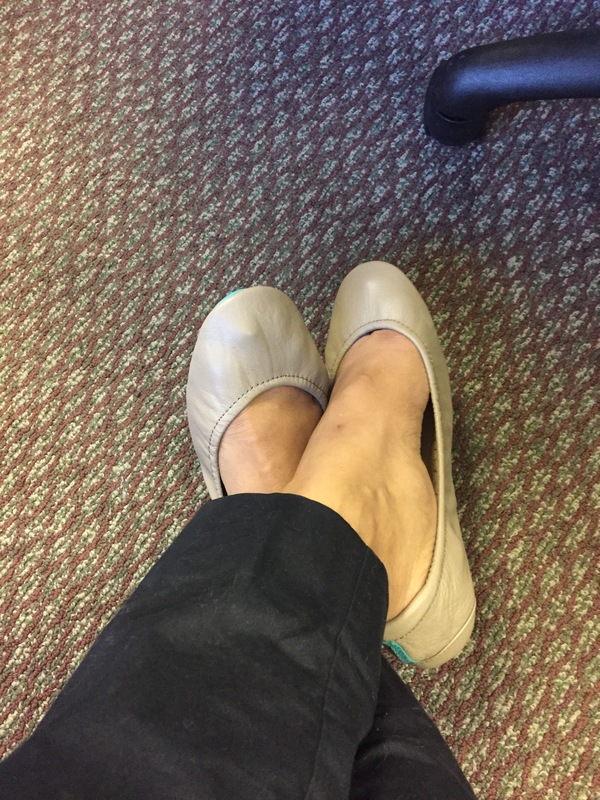 I invested in a pair of black Tieks (size 7; they only offer half sizes and I am a consistent 71/2) last May and grew to love them as my back up flats when a long day on heels wore me down. But at the end of the day, if I wore those for too long my toes screamed bloody murder, just like after a very long run even in appropriately sized sneakers. 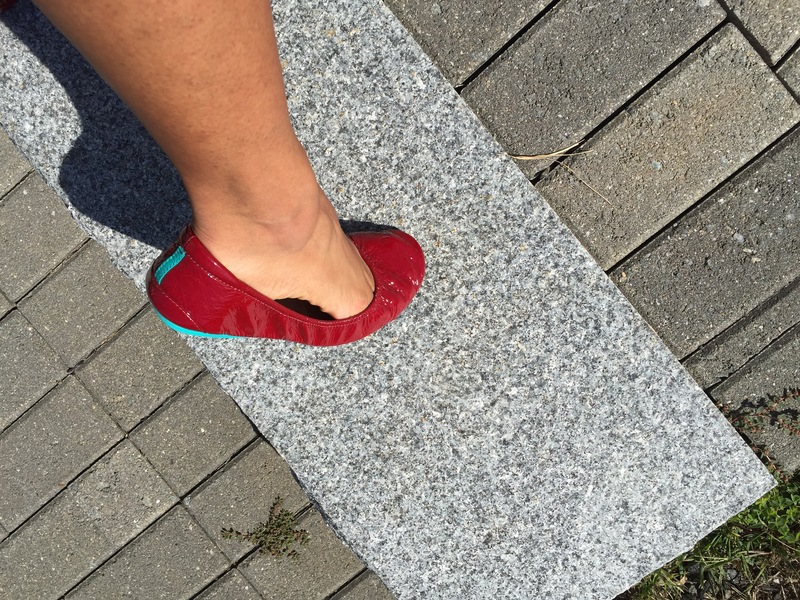 So recently as I went head-on into my flats mission I got another pair of Tieks, this time in size 8. Fit like a glove crafted from a baby’s bottom the first time around and voila today I wore my new ruby red pair to a wedding feeling totally fashionable. Tieks for the win! Here are some overly lit pics on this very sunny, perfect day for a wedding, day. There is much internet lore from women obsessed with their Tieks and I confess I might be going over to the flats dark side here. These are the most comfortable shoes (at least for my feet when sized correctly). I simultaneously ordered taupe (pictured below) and wore them for 12 hour days four days straight and hit the stadium seats for the Adele concert with them. No aches. No pains. No blisters. No break in needed. My first pair of ruby red had distractingly different crinkle (for OCD me anyway) between the right and left shoes so I exchanged them. As long as not worn outdoors, Tieks has a great return or exchange policy and they will even send a second pair to compare without charging you. Shipping in both directions is free. The packaging is totally cute and always arrives with a hand written note (I am a sucker for good customer service!) along with a pouch to hold the flats in their very compact form and a bag for your heels should you choose to use your Tieks as a heel back up. 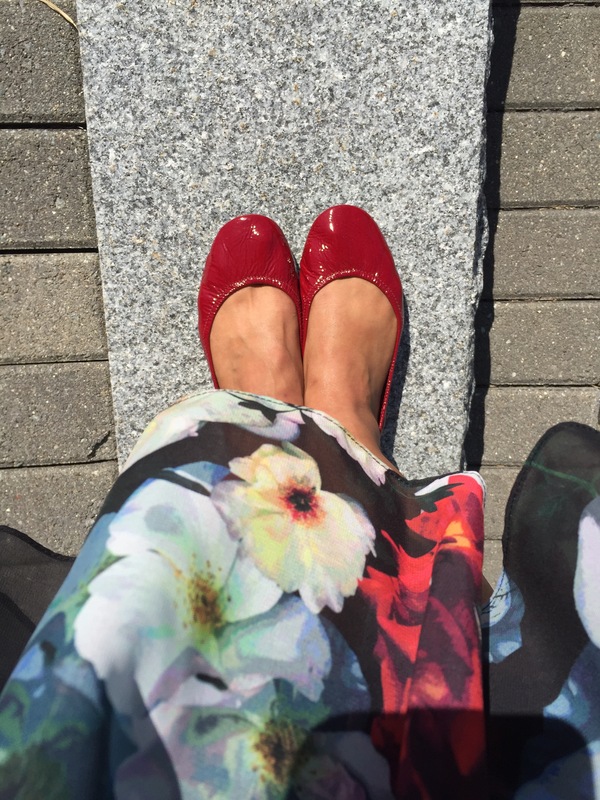 As a fan of bright hues, I am obsessed with the plethora of colors the flats come in. But for now I have red, taupe, and just ordered black in size 8. 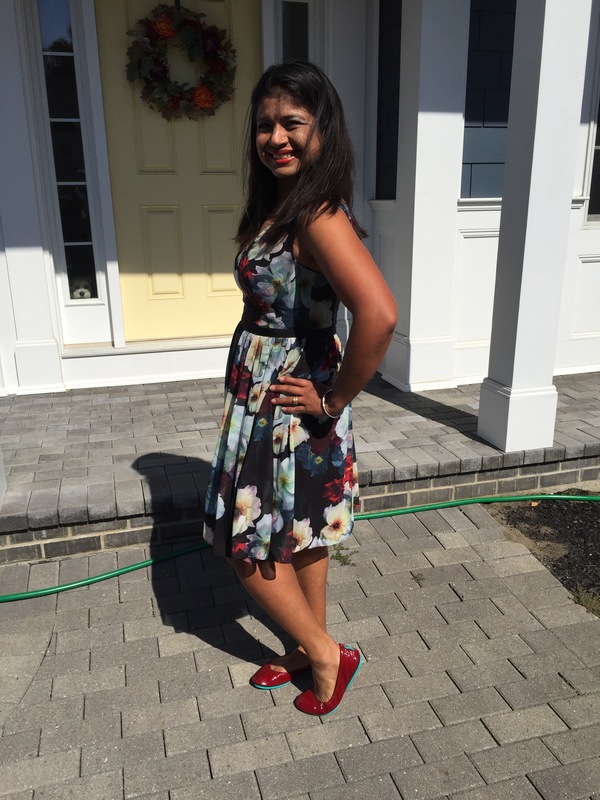 As always, while I would relish a new pair of heels or flats for free, unless clearly stated my reviews of my own purchases as in the case of all the Tieks cited in this post. Tieks can only be ordered online at tieks.com and sadly as far as I can tell they never go on sale. But I do believe they are well worth the investment. What makes you a #bettermother? Nope, not a better mother than your neighbor, than your friend, or than the president of your local PTA…but what makes you the best mother you can be? Going even further than that… What makes you successful as a person? As a human being? sowing seeds that benefit others”. Very recently I was approached by www.inspiringwomeninsurgery.com to provide some words of advice or encouragement, and while my 4 year old was brushing his teeth at night I thought about work/life “balance”, envisioned a set of scales, and came up with this. Why am I a #bettermother because I am a surgeon? Because I know my purpose in life, I am growing and I am sowing seeds. I know that this mother may be sad that I miss my son’s soccer practices, but I also know there are lots of other mothers out there that are glad I did… because I was able to help their children in their time of need. And although my children may miss me at times, I know they also gain valuable lessons from my career – independence and selflessness chief among them. My children always know that I love them, and they are important to me… whether I am sitting at their bedside, or at the bedside of one of my patients. 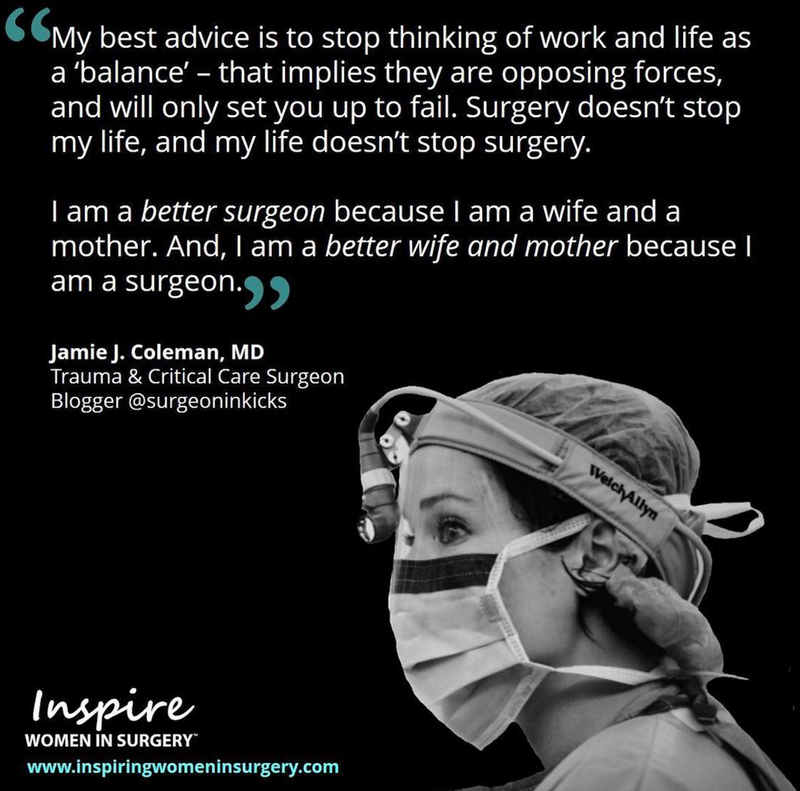 And no, you don’t have to be a trauma surgeon or work outside the home to be successful, or a #bettermother. Again, look at the definition. Nowhere in that definition does it mention spending every moment of every waking day with your child(ren). It doesn’t mention making your child’s first birthday cake by hand, or becoming Vice President of a company. Nor does it mention “leaning in” to the point that you are about to fall over. YOU are at the center of your success, and you have to give back to yourself in order to be in a position to give to others – whether that is your spouse or your children or your community. An example for you. The wife of one of my partners volunteers with her daughters’ Girl Scout troop. This makes her a #bettermother – not because she spends time in an activity that involves her own children, but because she gives of her time to an activity that gives many children joy when other mothers can’t. Another friend is a #bettermother because she is a Crossfit addict… She is teaching her daughter that strong is beautiful, and physical health helps build emotional health. Taking time in activities, away from your family, work related or not, that develop your sense of self, fulfill your purpose in life, and replenish your soul is not selfish. In fact, it is essential to being a #bettermother and a successful human being. So what makes you a #bettermother? Is it the 30 minutes you spent exercising this morning? Or is it the 2 hours over the weekend you took to train for a marathon? Is it the overnight business trip in another city that allowed you to present a project that will better your company? Is it the hours you spend volunteering at your child’s school because other mothers can’t? Is it that extra time you took at the hospital treating a patient who needed you? Is it the time you spend organizing a book club giving women the opportunity to fellowship with other women, building their support system? Success doesn’t require a title, or a degree, or a paycheck. It requires YOU being the best YOU possible. So take that time to develop yourself, replenish yourself, fulfill your purpose. Enjoy it. Own it. And snap a photo of yourself doing it. To keep as a reminder – when you are coming home late, or have 18 loads of laundry piled up, or serve Cheerios for dinner for the umpteenth time that week, or in any way feeling like you are “failing”…that you are, indeed, not. I am a #bettermother, and so are you. He could say these words as we were conducting our initial assessment in the trauma bay so at least he was hemodynamically stable with an intact airway at that moment in time. However, he had arrived seconds earlier with potentially life threatening injuries as a level 1 trauma activation. Based on the location of wounds that were visible on his torso this was a real possibility so we needed to quickly conduct our secondary assessment. That meant rapid exposure by taking the trauma shears, one on each pant leg from my assistants, as we examined him from head to toe, front to back, in every crevice or crease that might hide a wound. He relented. How could he not? The pants were already cut off even as I made eye contact. The process takes just seconds in the hands of a coordinated trauma team. He was a very polite young man. He didn’t yell or kick or scream. He followed all of our instructions. He quietly told us his health, social, and family history. He told us he was scared. His life story mirrored that of many of our trauma patients: food insecurity, lack of affordable housing, few resources for education and job training, addiction, interpersonal violence, an endless vicious cycle. He was caught in that cycle and it was obvious that he was heartbroken to be there. He wanted a better life and tonight in the trauma bay, without his pants, he had failed once again to break it. I always say that I was attracted to a career in trauma surgery because I am part surgeon and part social worker. In reality neither I nor the social worker employed by my hospital to help patients in need of socioeconomic support have much to offer our patients with these very real struggles. The policy level changes and investments that would bring grocery options, better schools, safe and affordable housing to our most underserved areas are not in our control. Even for those patients who want to make a change there are too few addiction treatment beds and job training programs. While these issues are clearly predictors of health, they are managed partly (addiction services) or entirely (basically everything else) outside of the healthcare system. Yet every day we see the ravaging effects of socioeconomic insecurity on our population’s safety and well-being when they become our patients. We open the trauma bay doors and provide the full armamentarium of modern medicine to save a life acutely while feeling powerless to save lives at the societal level*. We finished examining and working up our patient. He was not going to die that night and could be discharged. Discharged where? It was 3 in the morning. The social worker could give him the address of a shelter in town. There might be a bunk free. She could refer him to addiction treatment. There might be an available bed. A local non-profit might intervene in the light of day if we could make the connection. But we had no way to guarantee that this man, who was lucky to be alive, would not simply just slip back into his otherwise unlucky life after discharge. Oh, and there weren’t even any pants to give him. The social worker’s closet of donation was empty of men’s pants it turns out**. This was not something the trauma team to could bear. We might not be able to provide our patient with better groceries, housing, or addiction treatment to this man who in all of his words and actions as our trauma patient showed us a deep hope to be in a better place in life; but the least we could do is provide him the dignity of a pair of pants to head back into his unfair reality. So we pooled our cash on hand, asked him what size he wore, and waited until the local Target and Kohl’s opened***. The next morning the light in his face and the sincere words of gratitude when he saw his new jeans and a back up pair of track pants and shorts felt like as much of an accomplishment as stabilizing the unstable patients who had entered the trauma bay earlier or the exploratory laparatomy we had done. He needs so much more. But this was the least we could do. *NB: Most trauma centers do provide targeted injury prevention like helmet, seat belt, or firearms safety education through small investments or grant funding but these typically address to specific injury mechanisms rather than social policy. **Men be like the ladies and cull your closets seasonally; donate to your local trauma center. ***If any Kohl’s or Target folks are reading this consider donating items or gift cards to your local trauma center.